UPDATE 29 Oct: WE WON our section! …… We’ve become a finalist in the 2010 Magazine Cover awards! I worked with New Zealand Geographic Magazine to create a special image to showcase our threatened New Zealand Falcon. 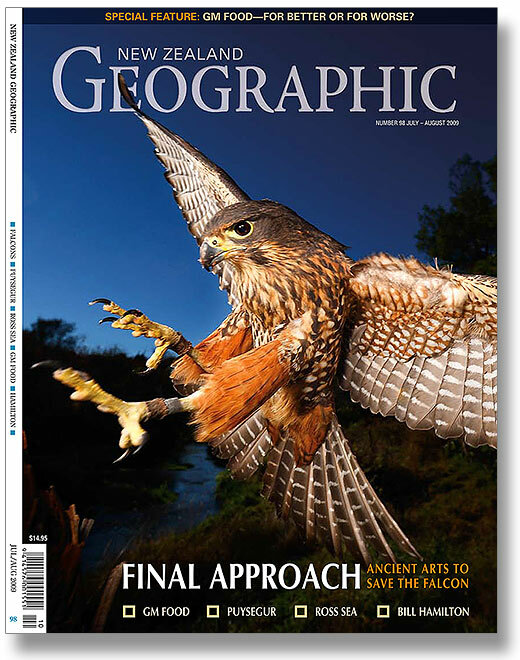 I’m very proud of the image and how NZ Geographic treated it. Obviously other people agree and of course, I’d love it to win the title. If you agree it would be great to get your vote here: http://www.themaggies.co.nz/vote-now/ (and there’s a $5 discount incentive on subscriptions). Fingers crossed. WELL DONE & CONGRATULATIONS Rob . . . I appreciate an amazing amount of effort must have gone into getting that image (not to mention the years building up your skills) Its a beaut. Thanks Greig, that means a lot from someone who knows how hard it is to get to some of the spots. Many thanks and kind regards. You're reading 2010 Magazine Cover Awards. We’re a finalist so far at Nature’s Pic Images Blog.